"Apnapan" is a 1977 hindi film which has Jeetendra, Reena Roy, Iftekhar, Aruna Irani, Sulakhshana Pandit, Sanjeev Kumar, Pinchoo Kapoor, Birbal and Madhu Chanda in lead roles. 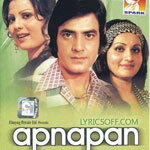 We have 6 songs lyrics and 4 video songs of Apnapan. Laxmikant and Pyarelal have composed its music. Anuradha Paudwal, Dilraj Kaur, Asha Bhosle, Lata Mangeshkar, Mohammad Rafi and Kishore Kumar have sung these songs while Anand Bakshi has penned its lyrics.